All those plants on the ground for as far as the eye can see? All new. Five hours later, I finished pricing and displaying everything...but it was worth the effort, as we have some intensely cool stuff out in our gardens right now. I'll post some specifics later, but trust me, it's well worth your time to pay us a visit soon! We've been doing a lot of garden design lately too. If you feel overwhelmed about what to get for your garden and how to set it up, shoot us an EMAIL and we can help. We have a special going on this month, for plant orders over $250, we'll come out to your house to see what you need, pick out plants for you, give you a discount on the cost of plants, deliver them, and set them up/place them exactly where they should be planted. You pay for the cost of the (discounted!) 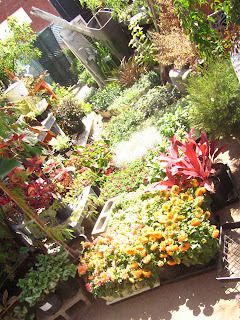 plants and take care of planting them, we take care of the design, delivery and placement.